Liverpool striker Daniel Sturridge is doubtful for Sunday's game against Southampton and will have a knee scan. Sturridge, 26, has missed the last two games after suffering a knee injury in training before the Premier League draw against Tottenham. On his chances of playing on Sunday, boss Jurgen Klopp said: "We have to proceed day-by-day. If he can train completely normal it is an option." Christian Benteke and Roberto Firmino are both available after injuries. Striker Benteke has been out for a month with a hamstring problem, while midfielder Firmino returned from a back injury as a substitute against Rubin Kazan on Thursday in the Europa League. 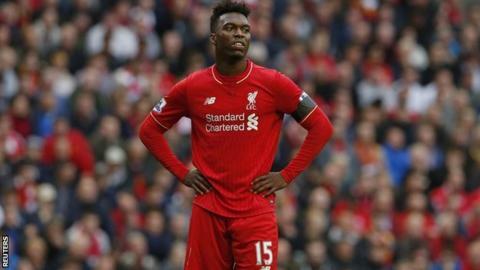 Sturridge scored 24 goals in 33 appearances in the 2013-14 season as Liverpool finished second in the league, but was blighted by injuries last term. The former Chelsea and Manchester City striker spent five months out with a thigh problem he suffered on international duty, which was then followed by a calf strain. He then had an operation on his hip in May, and spent the summer undergoing rehabilitation in the United States. This season, the England front man has two goals in three appearances. "On Friday, we have another treatment and another screening maybe because there is a little bit of fluid [inside the joint]," added Klopp. "It is not much better at this moment."